Not only is Doris (the new caregiver) totally spoiling Mom, but, now, Carina is in on that game too (well, she always has been actually) but she's moving her game up a notch. 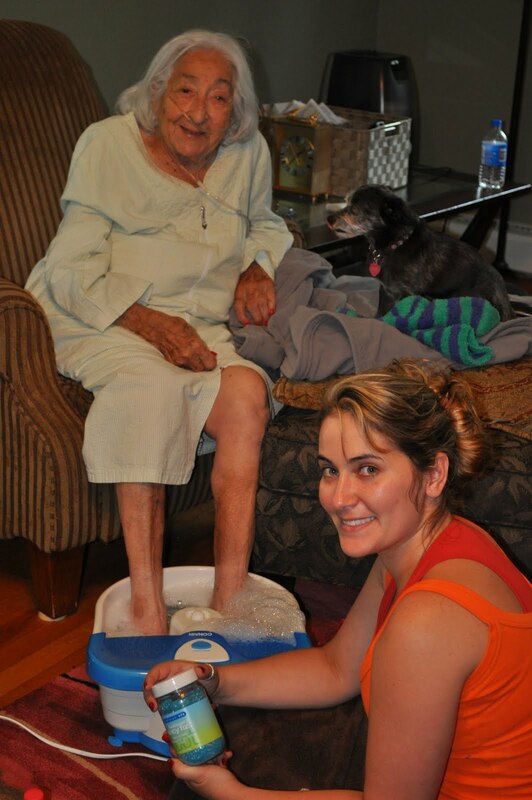 I came home 2 days ago to find Carina giving Mom a pedicure, including a nice soaking and massage. I told Mom not to expect this kind of treatment when they're not here. We're planning a girl's lunch out today. Carina, Mom and I are heading to my favorite watering hole, La Mex, as Mo, the bartender has specifically requested to see Mom. So, off we'll roll. Bobbi is coming up and Kimberly is going to try to make it too. Loads of fun. I've got a caregiver until 11 pm so John and I will head out for some dinner and dancing fun tonight. Date night, here we come! I've been writing more articles on Squidoo where the money is finally starting to come in. It's slow but steady at the moment and, with eHow no longer in the picture, it's the cream of the crop so far in replacing that residual income. Here's my latest efforts. Please share these links as I need all the love I can get! Can Carina or Doris come over and give me a pedicure next? You go, Gert!